Many Judy Garland fans (myself included) are now receiving the Delta Leisure Group‘s “Judy Garland Live at Carnegie Hall” CD released earlier this week. As excitement turns to disappointment, here are some things to think about. I’ve noted before my displeasure (and pet peeve) when people let their biases get in in the way of common sense. One of the results is that they pass judgment on things they haven’t seen, heard, or read. Regardless of what I might initially think of something, I’ve learned not to pass judgment until I have personally experienced what I’m talking about. It’s difficult. I strive to make this blog as non-biased as possible, promoting things I might not want to due to my own bias. I’m usually successful. I don’t post many reviews, and when I do I base them on actually experiencing what I’m reviewing. Seems logical, right? Biased behavior that breeds ignorant baseless assumptions is rampant online, especially in the Garland fan “community.” I normally don’t comment publicly about this. However, when it effects so many people over a period of time, both emotionally and financially, I have to speak up. 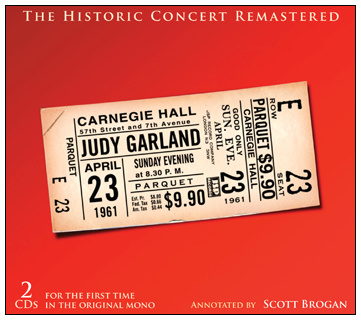 What I’m specifically talking about is centered on the two recent CD re-releases of Judy’s Carnegie Hall album. After JSP Records announced last summer that they were bringing the original LP version of the concert to CD for the first time (see image at right), biased-based assumptions thrived. Since that time, more and more declarative statements and assumptions have been made. What’s amusing, and distressing, is that the assumptions and declarations were made about both sets before they were even produced. No one had any idea what was actually on these sets outside of what was (in the case of JSP Records) noted in the announcements. No announcement was made about the Delta set; it simply appeared online. Unfortunately, Daniel Berghaus (or “clothed ambition” or “Buzz Stephens” or whatever other Sybil-personality he’s going by at any time) just can’t let go of his intense hatred of Lawrence Schulman. Without knowing a thing about the JSP set, Berghaus immediately came out against it via his Yahoo Group “The Judy Garland Experience.” Experience is right – a biased and censored one. Based on his comments, one would think he had the inside track about the contents. But no! He was making assumptions out of his own personal bias. A bias bred from hatred, nothing else. It was open season on Schulman again. They were “loaded for bear” with Berghaus leading the pack. John Fricke couldn’t resist, and in one of his typically rambling tirades he accused Schulman of just about everything (didn’t he do the same with his OTHER perceived competition, the late Scott Schechter? ), only to negate his words by mentioning all the previous DVD releases of the concert. Whoops! It’s never been on DVD because it wasn’t filmed. That sure confused some people. I don’t see Schulman trolling the various discussion boards or groups or Facebook (or what have you) dissing Berghaus or anyone else. Nope, the only time any of this comes up is at “The Experience” and through Berghaus. I shouldn’t be too surprised. 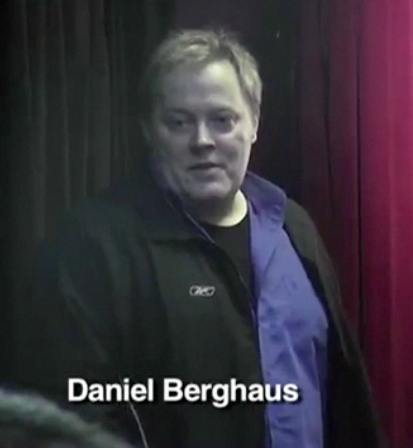 In December 2010 Berghaus used The Judy Garland Message Board for his own agenda, which was to go after Schulman. 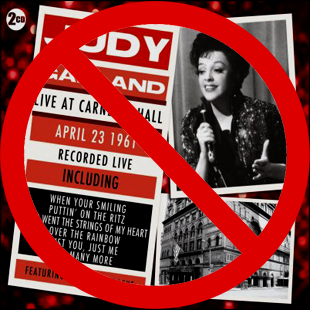 He was angry with Schulman for his factual comments about “The Experience” in his November 2010 article detailing the history of the “Judy Garland & Liza Minnelli Live at the London Palladium” recording. True to form, after Berghaus achieved his goal of driving out Schulman, Berghaus’ “contributions” to the board decreased dramatically, eventually becoming non-existent. There isn’t anything at the board to stroke his ego, so why contribute? Over at “The Experience” there isn’t much activity either. When there is a flurry of activity, it’s almost always negative. I would guess a good 90% is comprised of whining and complaining about this and that. If you drill down, you’ll find that an equally large percent of that is instigated by Berghaus himself. That makes sense. It’s his group and he makes sure it’s censored to suit whatever vendetta he has at any given time. I used to think that all discussion boards and groups were like that. They’re not. I’m a member of many non-Garland discussion groups that are civil and quite enjoyable. Maybe the difference is that a large percentage of Garland’s fans are fanatics in the true sense of the word. The price is dirt cheap and it has 14 bonus tracks!!!! Do not confuse this with the unappealing mono version that is being released…. But buyer beware, don’t confuse this with the abridged mono version that is also being released. That particular version is just a transfer of a vinyl record to CD. And why they are releasing it in mono, when we all know how much better Judy sounds in stereo, is beyond me. Must be from hunger. Poor Judy. The buzzards are still picking at her bones. And let’s not forget that they are charging three times as much for the mono version and that one doesn’t have 14 bonus tracks. Kind of sleazy of them if you ask me. What made his claims so amusing, and a perfect case study on how one’s bias can impede one’s judgment, is that he ignored his own alleged mantra of taking the high road and went on about a product that was suspect from the beginning. He did this out of his bias against the JSP set, not out of any knowledge of, or experience with, the Delta set. Remember, neither had been produced yet. Some argue that everyone’s entitled to his own opinion. That’s true, but only IF that opinion is based on fact and not hearsay or assumptions, or one’s obsessive desire to spew negativity out of a personal vendetta. This happens all the time though. Just look at all the freak-outs over the Peter Quilter play “End of the Rainbow” that’s currently on its way to Broadway. The loudest voices having a moo-cow over it have yet to actually see it. Worse, most are basing their “opinions” on an copy of an early book of the play from 2005! But back to Carnegie. What’s the result of Berghaus’ insanely bad behavior? That’s easy. Unsuspecting followers now hold a badly flawed product in their hands. A product that doesn’t do justice to the concert or Judy – something Berghaus (and buddies) claimed to be concerned about, but obviously weren’t. The cover art for the Delta set should have tipped everyone off. It misspelled “You’re” as “Your” in the title of “When You’re Smiling.” It features a photo not from Carnegie Hall but from the film Judy made one year later “I Could Go On Singing.” The set splits the concert not at the intermission but after “Stormy Weather.” The set added non-related tracks from Judy’s pre-Carnegie Hall studio albums. As if that weren’t enough, the two disc set sold for a bargain basement low price. So, the warning signs that this Delta set was a hack job were all there. But hey! Berghaus ignored them anyway. But like I said, if you want to hear the album as it was first released to the world, here you go. Now that I have my own copy of the Delta set, let me tell you: It’s bad. Really bad. I had hoped that with the JSP set presenting the original mono LP, the Delta set would present the original stereo LP. That would have made the two perfect bookends for each other. They would have complemented the expanded, complete 2001 Capitol set and the 2000 “Gold” set quite well. But no, this second set is not the original stereo LP. For starters, the liner notes aren’t really notes at all, and they’re incorrect. No authorship is provided. Liner notes or booklets can be overlooked if the errors are minor, but these are simply wrong. The real travesty is in the content. The sound quality is tinny and the concert sounds a bit sped up. Each song from the concert is split up as a separate track. Each one fades out (usually very slowly), then a pause, then the next one fades in. Some start right off with the music only to fade out as the others do. In other words, the concert is gone and in its place is what would seem (especially to anyone who’s never heard it before) to be a compilation of live performances. It’s presented like a compilation or studio album. To make matters worse, the fade-in to “Over the Rainbow” doesn’t finish until after Judy begins singing. Her voice is low then gets louder with the fade-in. Did that happen at the concert? The same thing happens on a few of the other tracks such as “That’s Entertainment!” and “You’re Nearer.” This Delta set is bad. Just bad. As if the above isn’t enough, the set completely omits what little chatter there was from the original LP. The famous “Do you really want more? Aren’t you tired?”, “I know, I’ll sing ’em all and we’ll stay all night!” and the rest of the spoken bits are gone. The exception is Judy’s “One, two, one-two-three. Ooh, it worked!” prior to “Who Cares?” and “I don’t know…” prior to “How Long Has This Been Going On?” both of which had to be included because they overlap the beginning of the numbers. Inexplicably Judy’s additional “One, two, one-two-three” prior to “Just You, Just Me” is included. After Judy’s last song, “Chicago,” the “concert” fades out. No “Goodnight! God Bless” from Judy as on all previous releases, including the original LP. Taking only the songs, and no talking, in order to avoid copyright issues, the label, I suspect, used the expanded 2001 version as their source. It makes sense as it’s obvious the label and producers had no clue what was and wasn’t included in the original LP release, nor the expanded release. They simply took each song and added the fades. There are no production credits and no author credits, only the label information. Talk about a “hack job.” In other words, all that’s wrong with this Delta set are exactly what Berghaus assumed would be wrong with the JSP set. Whoopsie again! If there is a moral to any of this, and any explanation as to why I’m addressing this in the first place, it would be to remind everyone NOT to listen to people who are making assumptions based on their own personal petty biases. My comments above about the Delta set are based on my actually getting the CD and listening to it. How else can anyone pass judgment on anything without first-hand experience? So people, make up your own minds, and don’t let others make your decisions for you. Especially if those people are giving advice just to suit their own biased agenda or hatred of others. Sadly, the result of Berghaus’ vendetta is that everyone who followed his advice is now stuck with an incredibly bad CD and fifteen dollars (or so) missing from their bank accounts. If I had followed his advice, I’d ask for my money back. All hail to you…Ha Ha Ha….Brilliant! Simply Brilliant! Given enough rope Berghaus will surely hang himself someday soon. Well…We can but live in hope : ) All wars come to an end eventually and ‘little’ Hitler brat’s get their just deserts! What a prat!! !